Fatigue or lack of endurance? Weakness in your hands or forearms? Tingling, numbness, or loss of sensation? Heaviness? Do your arms feel like dead weight? Lack of control or coordination? Sympathy pains? Do your hands hurt when someone else talks about their hand pain? 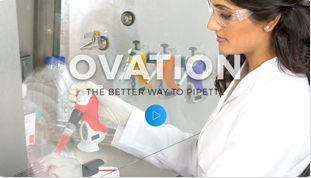 We know that micro-pipetting is the major cause of pain and Repetitive Strain Injury (RSI) in the lab, but do you realize that the same effects can come from using serological pipets? Serological pipets have had the same design forever, requiring you to use high-force jamming to get the pipets all the way into your controller. If you don’t use force, you risk wobble and dripping. Less Jamming. Much Lower insertion force to get the pipet in and out of the pipet controller. Less Drip. We receive accolades for Wobble-not’s Less-Drip value. Dripping affects accuracy and precision, increasing costs by forcing you to repeat your experiment over and over again. Less Force on Wrists & Joints. Lower force requirement reduce your risk of stress and injury. Less Wobble. More Time. When you have a wobbly pipet, you have to move more slowly and deliberately to keep your arm and hand steady. This slows down the whole process and can cause arm fatigue. Less Loss + Less Mess. 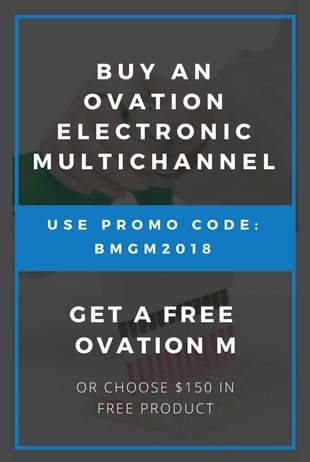 “Lost” reagents in drips cost money, create a messy benchtop or hood surface, and introduce the possibility of contamination from your sample. When we ask people to compare the traditional serological pipet to the Wobble-not pipet, they realize how much force it takes to insert and remove the old pipets from the controller. Force can lead to stress and chronic pain. The force required to jam the pipet into the controller can strain your wrists, especially when there is repetition involved. Women who have thinner wrists especially feel the difference Wobble-not makes in their day-to-day life in the lab. 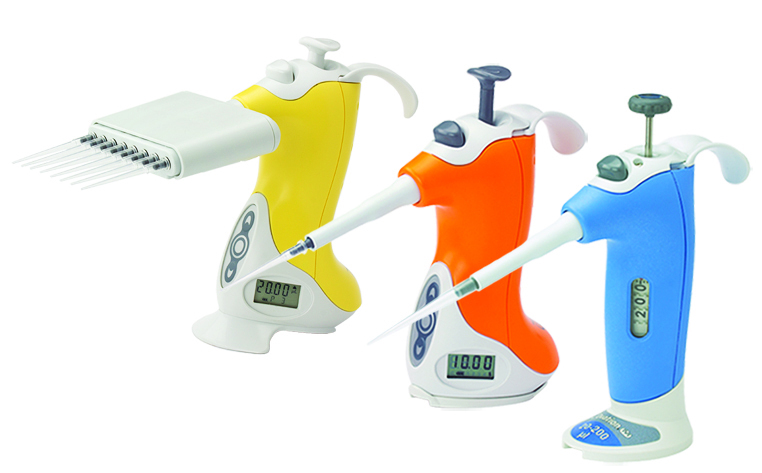 To prevent Repetitive Strain Injury (RSI) Ergonomists recommend that the force for inserting a serological pipet be kept below 1.5kg. Of all serological pipets tested, only the Wobble-not assured minimal wobble at 1.5kg. All other serological pipets tested had unacceptable wobble at 1.5kg insertion force, and they required three times that force to come near the wobble performance of the Wobble-not. Your wrist is a complex joint made up of eight small bones, arranged in two rows, between the bones in your forearm and the bones in your hand. Tough bands of ligament connect your wrist bones to each other and to your forearm and hand bones. Tendons attach muscles to all of the bones. Damage to any of these parts of your wrist can cause pain and affect your ability to use your wrist and hand. If your wrist is not given enough time to rest, the sheaths that cover delicate tendons run out of lubrication causing tendon and sheath chafe. The result is pain. This abrasion also causes tendons to become inflamed and begin to pinch neighboring nerves. This can result in numbness, tingling, or hypersensitivity to touch. Any activity that involves repetitive wrist motion—using a mouse, typing on your computer, hitting a tennis ball, or bowing a violin—can inflame the tissues around joints or cause stress fractures. The danger is especially high when you perform the movement for hours on end without a break. This constant motion can lead to Repetitive Strain Injury (RSI). RSI is a cumulative trauma disorder stemming from prolonged repetitive, forceful, or awkward hand movements. The result is damage to muscles, tendons, and nerves of the neck, shoulder, forearm, wrist and hand, which can cause pain, weakness, numbness, or impairment of motor control. Activities such as pipetting can be harmful when posture and range of motion are compromised. Fine hand movements, repeated daily for hours on end, over and over, eventually strain the muscles and tendons of the forearms, wrists, and fingers, causing microscopic tears. Injured muscles tend to contract, decreasing the range of motion necessary for stress-free work. 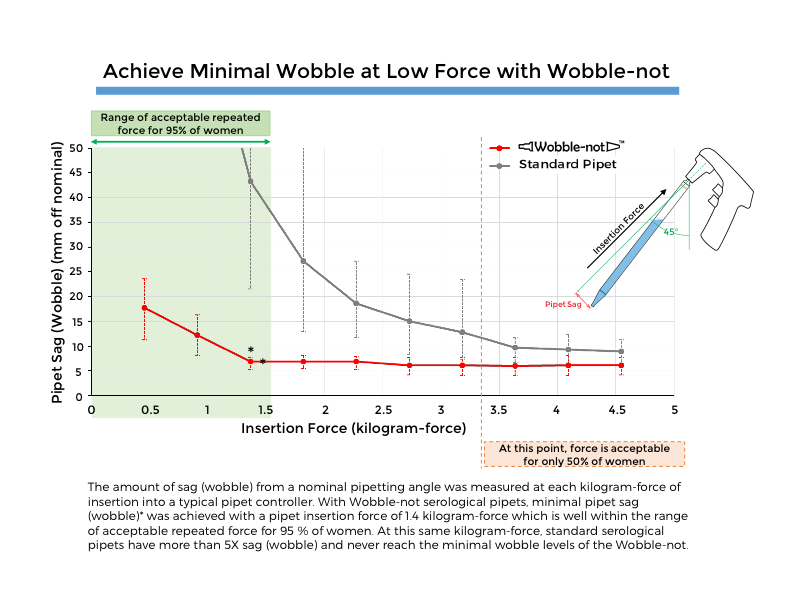 Wobble-not interrupts the chronic cycle of RSI by eliminating the necessity for high insertion force to insert your pipet into the pipet controller nozzle. Wobble-not serological pipets also have higher torsional stiffness. That means less movement (less sag/less wobble), more stability, and more pipetting control, all of which benefit your research applications. In The Lab, Accuracy Matters, Cost Matters & Health Matters. Tools can make or break your performance and ultimately cost your business time and money. Wobble-not reduces the need for repeated applications of precious liquids, which also helps reduce waste, fatigue and stress. With Wobble-not, VistaLab’s latest never-before-seen innovative design, you get maximum stability with little force, less wobble and less dripping which reduces waste and repeated efforts! And less pain! + TRY IT TO BELIEVE IT!